During the first half of 2017, equity markets posted solid gains with the S&P 500 Index climbing 9.0% while gold and bond prices also moved higher. The strength across diverse asset classes made for strange bedfellows as strong earnings momentum boosted stock prices while lackluster economic data, such as GDP growth and durable goods, created short term economic uncertainty. The S&P 500 Index posted the strongest first quarter earnings growth since 2009. Further growth is projected for this quarter with estimates hovering at 6.6% and 7.4% for the third quarter*. First quarter earnings growth was not just a result of cost cutting and share repurchases but was top line driven with revenue growth of 7.6%, which was the strongest showing since the fourth quarter of 2011. Positive earnings and revenue growth combined with a stronger economic backdrop should move the market higher, although the current ultra-low volatility market environment is bound to be disrupted before year-end with a short term correction. The higher U.S. equity valuations only reinforce our belief in the importance of fundamental stock selection and sector orientation. So far this year, growth stocks recouped losses from 2016, outperforming value stocks, highlighted in the Technology and Consumer Discretionary sectors. Large-cap Technology names such as Apple, Microsoft, Amazon and Facebook outpaced traditional value stocks in the Energy and Financial sectors like ExxonMobil, Berkshire Hathaway, JPMorgan and Wells Fargo. Growth stocks gave back some of their return in mid-June as value stocks regained momentum in undervalued sectors. Thirty-four U.S. bank capital plans subject to the annual CCAR stress test (Comprehensive Capital Analysis and Review) were approved by the Federal Reserve including share repurchases and dividend increases. In the aftermath of the financial crisis, average common equity capital ratios improved dramatically to over 12.0% in the first quarter of 2017 versus 5.5% in the first quarter of 2009. Subsequent to the CCAR review, five of the largest U.S. banks immediately raised their dividends over 40%, bringing their average dividend yield above the S&P 500 Index yield of 2.0%. The increase raised some dividend payout ratios above 30%, which had previously been a watermark for U.S. banks after the financial crisis. In 2018, the 30% payout ratio level will probably be removed in the CCAR test allowing banks to pay higher dividends. Longer term Financials are an attractive sector for the High Dividend Equity portfolio which seeks companies demonstrating dividend growth and rising earnings growth. After seven years of pushing U.S. banks toward improved capitalization, the market is also looking for possible deregulation and a continued rising interest rate environment for an enduring Financial sector rally. Top performing sectors included Health Care rising 6.6%, Industrials up 4.1% and Financials increasing 3.8%. The worst sector performance was found in Staples up a mere 0.9%, Energy down 7.0% and Telecom declining 8.1%. Leading companies included UnitedHealth Group up 13.5%, Las Vegas Sands rising 13.2% and Ingersoll-Rand returning 12.8% while decliners were IBM down 12.8%, Cisco declining 6.5% and Kraft Heinz lower 5.0%. According to FactSet, nine S&P 500 sectors are estimated to report year-over-year earnings growth with the highest estimates occurring in Energy, Technology and Financials while declines are projected for Consumer Discretionary and Utilities. 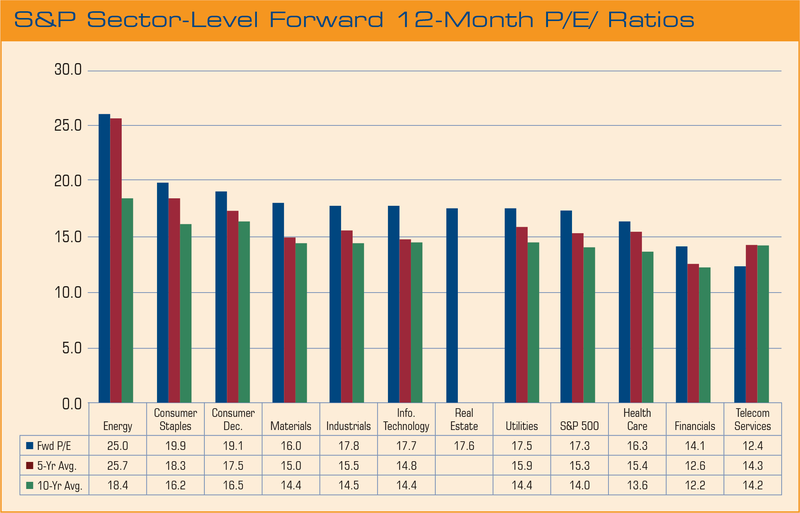 Continued earnings and revenue expansion in the second half of the year will be important as every S&P 500 Index sector is currently trading above its five year average 12 month forward P/E level with the exception of Telecom (see chart). Barclays Capital U.S. Government/Credit Bond Index measures the performance of U.S. dollar denominated U.S. Treasuries, government-related and investment grade U.S. corporate securities that have a remaining maturity of greater than one year. The CBOE Volatility Index® (VIX®) is a key measure of market expectations of near-term volatility conveyed by S&P 500 stock index option prices and shows the market’s expectation of 30-day volatility. It is constructed using the implied volatilities of a wide range of S&P 500 index options. This volatility is meant to be forward looking and is calculated from both calls and puts. The VIX is a widely used measure of market risk. The S&P 500 measures the performance of the 500 leading companies in leading industries of the U.S. economy, capturing 75% of U.S. equities. The Barclays Capital U.S. Aggregate Bond Index is a market capitalization-weighted index, meaning the securities in the index are weighted according to the market size of each bond type. Most U.S. traded investment grade bonds are represented. Municipal bonds, and Treasury inflation-protected securities are excluded, due to tax treatment issues. The index includes Treasury securities, government agency bonds, mortgage-backed bonds, corporate bonds, and a small amount of foreign bonds traded in the U.S. The Barclays Capital Aggregate Bond Index is an intermediate term index.